Been a committed and frustrated Viking fan since the 1971 season, a disappointing end to that season as well. Lots of anger has accumulated over this span. I'm at the point of thinking I will never see us hoist the Lombardi trophy. Never in my lifetime did I think I'd live to see the day that the Saints, Seahawks, Bucs and even the Eagles would get one before we did. But.............here we are and I don't see the drought ending anytime soon, certainly not this year. Our O-line does not perform at an SB level. No amount of coaching or scheming can turn this group into an SB unit. Our LBs are soft against the run and our safeties are simply too slow in coverage. I like the rest of the pieces and units on this team. However, as we saw in the Sains game............the Vikings always find a way(s) to do extraordinarily stupid things in order to grab hold of defeat. This is what has angered me more than anything over the years, the catastrophic and simply inexplicable ways we've found to lose. I still love this goofy team and will never stop rooting for them. First of all I hope you're enjoying the board. I agree some of the performances have looked pretty bleak this season and injuries are hurting us a bit. Also, as you said, the offensive line is a weak link. the Vikings always find a way(s) to do extraordinarily stupid things in order to grab hold of defeat. Cousin's interception in the Saints game and Adam's fumble were the major reasons for the loss rather than the actual weak link (the offensive line). I don't think anybody would consider either of those players a "weak link" on the team but their play directly contributed to the loss. That's are history with the Saints, it seems. I'm thinking Peterson in the 2009 championship game, of course, and Favre's INT. We seem to have our best players make big mistakes in big moments. Lets not even get started on kickers in that regard. After witnessing so many horrific and devastating disappointments by this franchise, it's really hard to find optimism. I agree. The Oline didn't cost us the Saints game. Our QBs have been sawed in half the last few seasons due to historically awful Oline play. Any game where our QB can walk off the field afterward is a good one for the Oline. And now............Bailey, Mr Perfection, is missing PATs and chip shot FGs???? Really? Is it the horns on the helmets? These guys just drive me nuts!!! I will give it up for the D. When focused, they are as good as any D in the NFL. Breeze with under 150 pass yards? An amazing performance from the D. They did their part!!! Welcome! Look forward to reading more posts by you. Also Cliff let's dont forget the way Pete Morelli and his crew did EVERYTHI NG possible to ensure the Saints won the game. And welcome to the board buddy. Hope u love it here as much as I do. I'm 54 and been a Vikes fan since I knew what football was. Let's just say I slept many nights in my Vikings helmet and Vikijg PJs, so I've lived my whole life on the Vikes rollercoaster. If we can ever win the SB I would be happy to enjoy it for a wk and due happy Haha. So your in like minded long suffering friends here.. but I will never surrender or stop. 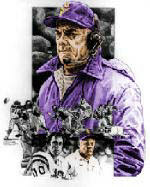 I will still always bleed purple!